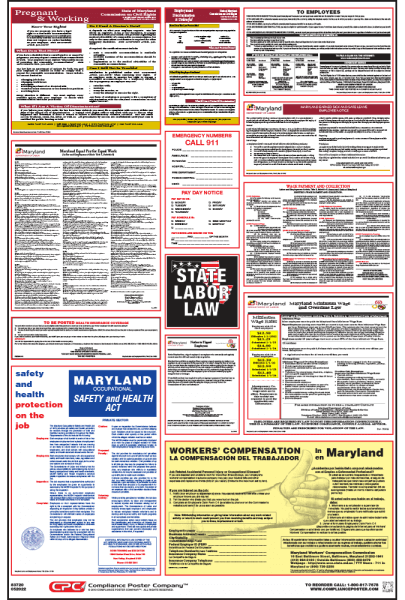 Federal and Maryland laws require employers to post notices informing employees of their rights and protections while performing work for their employers. Maryland Labor Law Posters contain each of the state and federal mandatory labor law notices that must be posted in the workplace. Maryland employers may also be required to post a separate city or county poster depending on their location. Maryland Healthy Working Families Act took effect on February 11, 2018, requiring all employers to provide employees earned sick and safe leave for their own health condition or to care for a family member; for preventive care for themselves or a family member; for maternity or paternity leave; and leave for reasons related to domestic violence, sexual assault or stalking. Employers are required to post the new Earned Sick and Safe Leave Employee Notice. Maryland Department of Labor, Licensing and Regulation, Unemployment Insurance Division, has released a required update to the Employee Rights Under Maryland Unemployment Law with new contact information and relay number. Maryland’s Minimum Wage rate is scheduled to increase to $10.10 effective July 1, 2018. Montgomery County passed Bill 28-17 which raises the minimum wage rate for all employers effective July 1, 2018. The minimum wage rate depends on employer size. Later this year, Montgomery County is expected to release an updated minimum wage poster. Maryland Food Allergy Awareness Poster must be displayed in staff areas of all food services and food processing facilities. The Maryland No Smoking Poster must be conspicuously posted in an indoor area open to the public and every public entrance to an indoor area that is open to the public. Visit our FREE Labor Law Posters download page to see if your state has additional posting or notice requirements specific to your business. FREE Federal forms, workplace checklists and safety precautions are also available.